This book s a profusely illustrated interpretation of life along Ohio’s nineteenth-century canal system: the Miami & Erie Canal in the western part of the state, and the Ohio & Erie Canal with its multiple feeders in central and eastern Ohio. An introduction by George W. Knepper, professor of history at The University of Akron and president of The Ohio Historical Society, places the state’s canal system in national historic perspective and addresses such issues as the importance of the Ohio canal system in the state’s economy and industrial development; the interrelationship between the Industrial Revolution in Ohio and the changing uses of canals; and the impact of the canal system on contemporary social and ethnic issues. 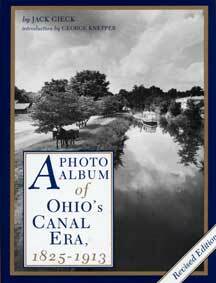 The volume contains over 500 photographs and illustrations from the archives of The Canal Society of Ohio, The Ohio Historical Society, The University of Akron’s Archival Center, and other archives throughout the state, including individual collections. Relatively few of these pictures have been seen by the general public, and many are as old as photography itself. The text, photo captions, and sidebars describe in simple terms the construction process and the operation of locks. In readable and entertaining prose Gieck recounts the efforts of the people involved in the planning and building of the canal system, and he draws an admiring yet candid picture of the picturesque canalers who made their livelihood upon the canal waters. Designed in an oversized format, this long-awaited volume will be welcomed by historians and engineers as well as by the many who find in the surviving canals a fascinating symbol of Ohio’s heritage. Jack Gieck was an engineer and past-president of the Canal Society of Ohio and founder of Cinemark, Inc., a producer of technical and historical films including the award-winning video series Ohio’s Canal Era. He is also the author of Early Akron’s Industrial Valley: A History of the Cascade Locks (Kent State University Press, 2007).